When you are injured in an Accident or the case of malpractice or personal injury, you may face not only a difficult recovery but various legal complications as well. An experienced lawyer can offer advisement for the opportunity to recover the financial losses of an incident, easing the hardship of your situation. However, any case can be made stronger and simpler with your initiative to help your own case. To have the best chances for success, make sure to keep track of important documents, and information. Police Reports, made at the scene of an accident, are a helpful tool to which your layer can refer throughout your case. These are essential to the confirmation of what took place and who exactly was at fault for the accident. They are simple to obtain at the police station in the town of the crash. Medical Records determine the severity of your injury and its contributing financial losses. With these records, your lawyer will have a better understanding of your case and what he or she can do for you. These records may include those of MRI’s, CT scans and X-Rays. Receipts and Bills will affirm the amount of money you had to spend or pay in bills in association with your case. These prove the financial losses you suffered and will assist your attorney in calculating an accurate settlement. Pay Stubs are crucial to your case if you are out of work because of the injuries you’ve received. With copies of your job’s most recent pay stubs, your lawyer can conduct a settlement for future lost wages. In order to complete this, it is essential that your potential earnings are accurately recorded and calculated. Photos are beneficial to a case for their use as a visual aid. 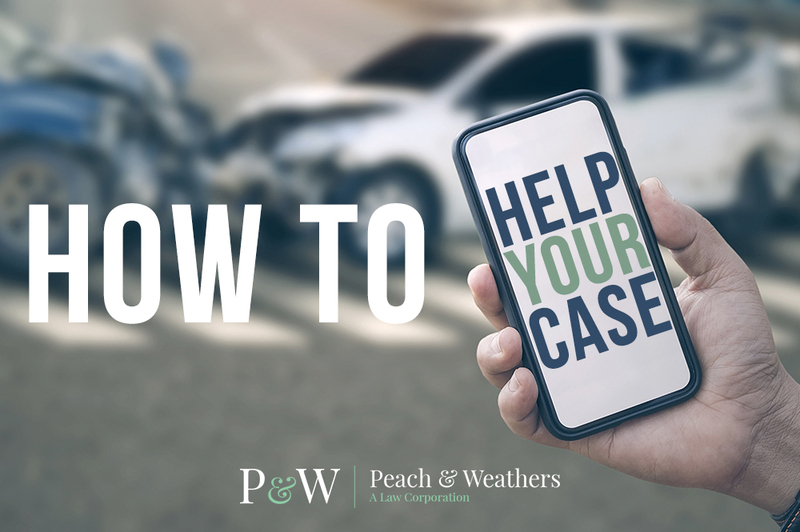 If you were able to take them, pictures of the scene of an accident could provide insight into the details of your case. You may also obtain photographs if they are available from the police station. When you are injured, be sure to help your own case by providing diligent and detailed recordation for your lawyer. And whenever you face the devastation of an injury, please do not hesitate to reach out to us at Peach & Weathers Law Firm.